Educational Qualification: M.D., M.P.H., Ph.D. Designation: Director and Attending Physician at Taipei Medical University, Taiwan. Biography: Dr. Szu-Yuan Wu is a Director & Attending Physician, Department of Radiation Oncology, Taipei Medical University - Wan Fang Medical Center, Taiwan. Szu-Yuan received M.D from China Medical University, Taiwan, Master of Public Health Degree Program, National Taiwan University and then he gained his Ph.D. from National Taiwan University College of Medicine Graduate Institute of Toxicology. 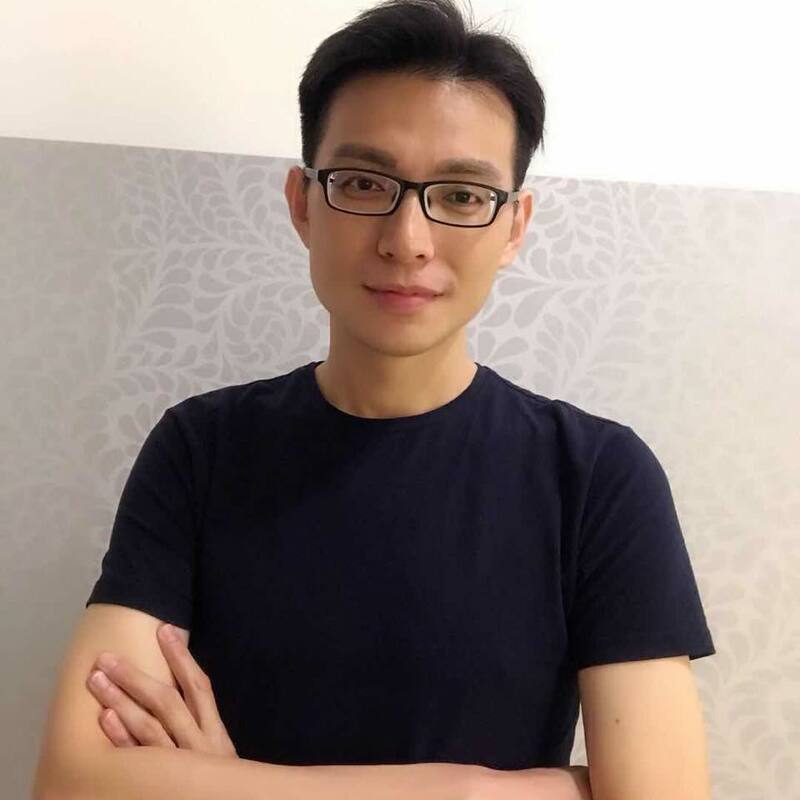 He is a Member of Cancer Committee, The Leader of Cancer Registration Database, Deputy convener of Head and neck cancer and Gynecologic Cancer team, Assistant Professor, Taipei Medical University, School of medicine, Assistant Professor, Department of the Ministry of Education, Taiwan. He has published more than reviewed papers. Li., Y.-W., Lin., J.-P., Chen., C.-Y., Liang-Ming Lee, Lin., K.-H., Wen., Y.-C., . . . Wu SY*. (2014). The dosimetric impact of daily setup error with image-guided radiotherapy for prostate cancer. Therapeutic Radiology and Oncology, 2014; 21(0): 1-10. Chang-I Chen, Ching-Feng Kuan, Yu-Ann Fang, Shing-Hwa Liu, Ju-Chi Liu, Li-Li Wu, Chang Chun-Jen, Hsuan-Chia Yang, Jaulang Hwang, James S Miser, and Wu SY*. (2015). Cancer Risk in HBV Patients with Statin and Metformin Use: A Population-based Cohort Study. medicine. (article in press) (Ranking: Medicine, General & Internal 15/156 Impact Factor: 5.723). Jin-Hua Chen, Yu-Chun Yen, Liu, S.-H., Lee, F.-P., Lin, k.-c., Lai, M.-T., Wu, C.-C., Chen, T.-M., Sheng-Po Yuan, Chia-Lun Chang, and Wu SY*. (2015). Dementia risk in irradiated head and neck cancer patients: a combined study of two national cohorts in Taiwan. Medicine. (article in press) (Ranking: Medicine, General & Internal 15/156 Impact Factor: 5.723). Joni Yu-Hsuan S, Lee F-P, Chia-Lun Chang, Wu* S-Y. Statin-based palliative therapy for hepatocellular carcinoma Medicine 2015. (article in press) (Ranking: Medicine, General & Internal 15/156 Impact Factor: 5.723). Chun-You Chen, Hsiao Wei Yu, Chi-Yeh Lin, Chiu-Ping Chen, Chih-Cheng Chou, Tzu-Hsin Chen, Yi-Ju Chen, Hao Wang, Chun-I Li, Chia-Yi Tsai, Chia-Hui Chen, and Wu SY*, 'Evaluation of the Dosimetric and Radiobiological Impacts on Prostate Cancer Patients of Daily Image-Guided Volumetric Modulated Arc Therapy', Therapeutic Radiology and Oncology (2015). Chi-Yeh Lin, Chun-You Chen, Chiu-Ping Chen, Chih-Cheng Chou, Tzu-Hsin Chen, Yi-Ju Chen, Hao Wang, Chun-I Li, Chia-Yi Tsai1, Chia-Hui Chen, and Wu SY*, 'Microrna-17-5p Regulation of Apoptosis-Related Protein Expressions in Oral Squamous Cell Carcinoma Cells Is Related to Betel Quid Chewing', Therapeutic Radiology and Oncology (2015). Jin-Hua Chen, Yu-Chun Yen, Shing-Hwa Liu, Sheng-Po Yuan, Li-Li Wu, Fei-Peng Lee, Kuan-Chou Lin, Ming-Tang Lai, Chia-Che Wu, Tsung-Ming Chen, Chia-Lun Chang, and Wu SY*Outcomes of induction chemotherapy for head and neck cancer patients: a combined study of two national cohorts in Taiwan. Medicine 2016. (article in press) (Ranking: Medicine, General & Internal 15/156 Impact Factor: 5.723). Ju-Chi Liu, Yi-Ping Hsu, Wen-Rui Hao, Shing-Hwa Liu, Chao-Feng Lin, Li-Chin Sung, and Wu SY. Influenza Vaccination Reduces Dementia Risk in Chronic Kidney Disease Patients: A Population-Based Cohort Study. Medicine 2016. (article in press) (Ranking: Medicine, General & Internal 15/156 Impact Factor: 5.723). Jin-Hua Chen, Yu-Chun Yen, Shing-Hwa Liu, Sheng-Po Yuan, Li-Li Wu, Fei-Peng Lee, Kuan-Chou Lin, Ming-Tang Lai, Chia-Che Wu, Tsung-Ming Chen, Chia-Lun Chang, and Wu SY Curative-intent aggressive therapy improves survival of elderly patients with locally advanced head and neck cancer and a high comorbidity index. Medicine 2016. (article in press) (Ranking: Medicine, General & Internal 15/156 Impact Factor: 5.723). Ju-Chi Liu, Yi-Ping Hsu, and Wu SY. Statins Dose-Dependently Exert A Chemopreventive Effect Against Lung Cancer in COPD Patients: A Population-Based Cohort Study Oncotarget 2016. (article in press) (Ranking: Oncology 21/252 Impact Factor: 6.359). Ju-Chi Liu, Yi-Ping Hsu, Wen-Rui Hao, Shing-Hwa Liu, Chao-Feng Lin, Li-Chin Sung, and Wu SY. Statins dose-dependently exert a significant chemopreventive effect on colon cancer in patients with chronic obstructive pulmonary disease: A population-based cohort study. Oncotarget 2016. (article in press) (Ranking: Oncology 21/252 Impact Factor: 6.359). Ju-Chi Liu, Yi-Ping Hsu, Wen-Rui Hao, Shing-Hwa Liu, Chao-Feng Lin, Li-Chin Sung, and Wu SY. Statins Dose-Dependently Exert Significant Chemopreventive Effects Against Various Cancers in Chronic Obstructive Pulmonary Disease Patients Journal of cancer 2016. (article in press) (Ranking: Oncology 45/252 Impact Factor: 3.609). Li-Li Wu, Mao-Chih Hsieh, Jyh-Ming Chow, Shing-Hwa Liu, Chia-Lun Chang and Wu SY Statins improve outcomes of non-surgical curative treatments in hepatocellular carcinoma patients. Medicine 2016. (article in press) (Ranking: Medicine, General & Internal 15/156 Impact Factor: 5.723). Chien-Hsin Chen, Po-Li Wei, Mao-Chih Hsieh, En-Kwang Lin, Jeng-Fong Chiou, Yen-Jung Lu and Wu SY The outcomes of therapeutic decision in lower third rectal cancer patientsx. Medicine 2016. (article in press) (Ranking: Medicine, General & Internal 15/156 Impact Factor: 5.723). Ju-Chi Liu, Yi-Ping Hsu, Wen-Rui Hao, Shing-Hwa Liu, Chao-Feng Lin, Li-Chin Sung, and Wu SY. Statins and renin-angiotensin system inhibitors dose-dependently protect hypertensive patients against dialysis risk. PLoS ONE 2016. (article in press) (Ranking: MULTIDISCIPLINARY SCIENCES 11/63 Impact Factor: 3.234). Jin-Hua Chen, Yu-Chun Yen, Kevin Sheng-Po Yuan and Wu S-Y. Survival Prognostic Factors for Metachronous Second Primary Head and Neck Squamous Cell Carcinoma. Cancer medicine. 2016. (article in press) (Ranking: Oncology 122/252 Impact Factor: 2.915). Yen-Kuang Lin, Han-Lin Hsu, Wei-Cheng Lin, Jer-Hwa Chang, Yw-Chun Chang, Chia-Lun Chang, and Wu S-Y. Efficacy of postoperative radiotherapy in patients with pathological stage N2 epidermal growth factor receptor wild type adenocarcinoma and squamous cell carcinoma lung cancer. Oncotarget. 2016. (article in press) (Ranking: Oncology 21/252 Impact Factor: 6.359). En-Kwang Lin, Mao-Chih Hsieh, Chien-Hsin Chen, Yen-Jung Lu, Szu-Yuan Wu. Outcomes of Cytoreductive Surgery and Hyperthermic Intraperitoneal Chemotherapy for Colorectal Cancer with Peritoneal Metastasis. Medicine. 2016. (article in press) (Ranking: Medicine, General & Internal 15/156 Impact Factor: 5.723). Ju-Chi Liu, Yi-Ping Hsu and Szu-Yuan Wu. Influenza Vaccination Reduces Hemorrhagic Stroke Risk in Patients with Atrial Fibrillation: A Population-Based Cohort Study. International Journal of Cardiology. 2016. (Ranking: CARDIAC & CARDIOVASCULAR SYSTEMS 16/126 Impact Factor: 6.189). Yu-Chun Yen, Kevin Sheng-Po Yuan, Alexander T.H. Wu and Szu-Yuan Wu. Effectiveness of Esophagectomy in Patients with Thoracic Esophageal Squamous Cell Carcinoma Receiving Definitive Radiotherapy or Concurrent Chemoradiotherapy Through Intensity-Modulated Radiation Therapy Techniques. Cancer. 2017. (Ranking: Oncology 34/217 Impact Factor: 6.072). Shih-Chiung La, Wei-Chun Lin, Chien-Hsin Chen and Wu S-Y. Development of a Taiwan Cancer-Related Fatigue Cognition Questionnaire: Reliability and Validity. Oncotarget. 2017. (article in press) (Ranking: Oncology 21/252 Impact Factor: 6.359). Chien-Hsin Chen, Ping-Kun Hsiao, En-Kwang Lin, Yen-Jung Lu and Wu S-Y. A critical reappraisal for the value of tumor size as a prognostic variable in rectal adenocarcinoma. Journal of Cancer. 2017. (article in press) (Ranking: Oncology 45/252 Impact Factor: 3.609). Chia-Lun Chang, Kevin Sheng-Po Yuan and Wu S-Y. High-Dose or Low-Dose Cisplatin Concurrent With Radiotherapy in Locally Advanced Head and Neck Squamous Cell Cancer. Head & neck. 2017. (article in press) (Ranking: OTORHINOLARYNGOLOGY 1/43 Impact Factor: 3.376). Jer-Hwa Chang, Chia-Che Wu, Kevin Sheng-Po Yuan, Alexander T.H. Wu and Wu S-Y. Locoregionally Recurrent Head and Neck Squamous Cell Carcinoma: Incidence, Survival, Prognostic Factors, and Treatment Outcomes. Oncotarget. 2017. (article in press) (Ranking: Oncology 21/252 Impact Factor: 6.359). Mao-Chih Hsieh, Wei-Hua Lee, Alexander T.H. Wu, Jyh-Ming Chow, Chia-Lun Chang, Kevin Sheng-Po Yuan and Wu S-Y. Cyproheptadine use in hepatocellular carcinoma. American journal of cancer research. 2017. (article in press) (Ranking: Oncology 81/252 Impact Factor: 3.425). Wei-Cheng Lin, Yi-Fang Ding, Han-Lin Hsu, Jer-Hwa Chang, Kevin Sheng-Po Yuan, Alexander T.H. Wu, Jyh-Ming Chow, Chia-Lun Chang, Shee-Uan Chen and Wu S-Y. Value and application of trimodality therapy or definitive concurrent chemoradiotherapy in thoracic esophageal squamous cell carcinoma. Cancer. 2017. (Ranking: Oncology 34/217 Impact Factor: 6.072). C.L. Chang, H.C. Tsai, W.C. Lin, J.H. Chang, H.L. Hsu, J.M. Chow, K.S. Yuan, A.T.H. Wu, S.Y. Wu, Dose escalation intensity-modulated radiotherapy-based concurrent chemoradiotherapy is effective for advanced-stage thoracic esophageal squamous cell carcinoma. Radiotherapy and oncology : journal of the European Society for Therapeutic Radiology and Oncology (2017). (Ranking: RADIOLOGY, NUCLEAR MEDICINE & MEDICAL IMAGING 13/126 Impact Factor: 4.817). M.H. Wu, Y.L. Chen, K.H. Lee, C.C. Chang, T.M. Cheng, S.Y. Wu, C.C. Tu, W.L. Tsui, Glycosylation-dependent galectin-1/neuropilin-1 interactions promote liver fibrosis through activation of TGF-beta- and PDGF-like signals in hepatic stellate cells. Scientific reports 7 (2017) 11006. (Ranking: MULTIDISCIPLINARY SCIENCES 10/64 Impact Factor: 4.259). C.H. Chen, M.C. Hsieh, P.K. Hsiao, E.K. Lin, Y.J. Lu, S.Y. Wu, A critical reappraisal for the value of tumor size as a prognostic variable in rectal adenocarcinoma. Journal of Cancer 8 (2017) 1927-1934. (Ranking: Oncology 81/252 Impact Factor: 3.425). M.C. Hsieh, C.Y. Lu, W.W. Chang, S.Y. Wu, P.K. Hsiao, T.J. Liu, Experiences with cytoreduction surgery plus hyperthermic intraperitoneal chemotherapy in Taiwan. Medicine (Baltimore) 96 (2017) e7306. (Ranking: Medicine, General & Internal 15/156 Impact Factor: 5.723). Y.-H.J. Shao, T.-S. Chan, K. Tsai, S.-Y. Wu, Association Between Proton Pump Inhibitors and the Risk of Hepatocellular Carcinoma Hepatology (2017). (Ranking: GASTROENTEROLOGY & HEPATOLOGY 4/79 Impact Factor: 13.246). Chang CL, Tsai HC, Lin WC, Chang JH, Hsu HL, Chow JM, Yuan KS, Wu ATH, Wu SY. Dose escalation intensity-modulated radiotherapy-based concurrent chemoradiotherapy is effective for advanced-stage thoracic esophageal squamous cell carcinoma. Radiother Oncol 2017. (Ranking: Radiology, Nuclear Medicine & Medical Image,12/125 Impact Factor: 4.258). Chen T-M, Lin K-C, Yuan KS-P, Chang C-L, Chow J-M, Wu S-Y. Treatment of advanced nasopharyngeal cancer by using low-dose or high-dose concurrent chemoradiotherapy with intensity-modulated radiotherapy: A propensity score-matched, nationwide, population-based, cohort study. Radiother Oncol. 2017. (Ranking: Radiology, Nuclear Medicine & Medical Image,12/125 Impact Factor: 4.258). Chen C-H, Hsieh M-C, Hsiao P-K, Lin E-K, Lu Y-J, Wu S-Y. Tumor location is an independent predictive factor for distant metastasis and metastatic sites of rectal adenocarcinoma in patients receiving total mesorectal excision. Journal of Cancer. 2018. (Ranking: Oncology 90/217 Impact Factor: 3.376). Hsieh M-C, Chang C-L, Chow J-M, Yuan KS-P, Wu ATH, Wu S-Y. Adjuvant radiotherapy and chemotherapy improve survival in patients with pancreatic adenocarcinoma receiving surgery: adjuvant chemotherapy alone is insufficient in the era of intensity-modulation radiation therapy. Cancer medicine. 2018. (Ranking: Oncology 45/252 Impact Factor: 3.609). Wu SY, Kuan-Chou Lin, Jeng-Fong Chiou, Shiu-Chen Jeng, Wei-Hong Cheng, Chia-lun Chang, Wei-Cheng Lin, Li-Li Wu, Hsin-Lun Lee, Ruey-Jien Chen MicroRNA-17-5p Post-Transcriptionally Regulates p21 Expression in Irradiated Betel Quid Chewing-Related Oral Squamous Cell Carcinoma Cells. Strahlentherapie und Onkologie 2013. (SCI, IF: 4.16, ranking: 12/120). Wu SY, Lee YR, Huang CC, Li YZ, Chang YS, Yang CY, et al. Curcumin-induced heme oxygenase-1 expression plays a negative role for its anti-cancer effect in bladder cancers. Food and chemical toxicology: an international journal published for the British Industrial Biological Research Association. 2012. (SCI, IF: 3.078, ranking: 13/138). Wu SY, Eng-Yen HUANG, * Chan-Chao CHANCHIEN, Hao LIN, Chong-Jong WANG, Li-Min SUN, Hui-Chun CHEN, Fu-Min FANG, Hsuan-Chih HSU, Yu-Jie HUANG. Prognostic factors of radiotherapy for cervical cancer with computed tomography-detected para-aortic lymph node metastasis. Journal of Radiation Research 2013. (SCI, IF: 1.683, Ranking: 39/85). Wu SY, Hwan-Chung Lin, Wei-Hsiung Huang, Chun-Liang Tung, Hsueh-Lu Liao, Yen-Ching Karen Chen, Ying-Ray Lee, Yi-Hsuan Li, Yu-Hsing Lin. Irradiation-Induced Autophagy in Human Oral Squamous Cell Carcinoma Journal of BUON: official journal of the Balkan Union of Oncology 2014. (SCI, IF: 0.761, Ranking: 183/196). Chen Y-J, Wu SY; Chen, Chien-Chih; Tsao, Yu-Lin; Hsu, Nai-Chi; Chou, Yu-Chi; HUANG, Huey-Lan: Armillaria mellea component armillarikin induces apoptosis in human leukemia cells. Journal of Functional Foods, 2013 (SCI, IF: 2.632, ranking: 20/124) (Co-first author). Wu SY, Li-Ting Chang, Sydeny Peng, et al: Calcium Activated Gene Transfection from DNA/poly(amic acid-co-imide) Complexes. Int J Nanomedicine, 2014 (article in press) (SCI, IF: 4.195, Ranking: 32/256, Category: PHARMACOLOGY & PHARMACY). Wu SY, Fang FM, Kuo CY, Wang CJ, Chen HC, Hsu HC, Huang YJ, Wang CY, Huang EY*. Treatment Outcome following Three-dimensional Conformal Radiation Therapy (3D-CRT) for NK/T-cell Lymphoma of Nasal Cavity: A Single Institute Survey in Taiwan. Therapeutic Radiology and Oncology 2007; 14: 165-78. Wu SY and Liu SH. Brown seaweed fucoidan inhibits cancer progression by dual regulation of mir-29c/ADAM12 and miR-17-5p/PTEN Axes in human breast cancer cells. Journal of cancer 2016. (article in press) (Ranking: Oncology 45/252 Impact Factor: 3.609). Wu SY and Liu SH. MicroRNA-17-5p regulated apoptosis-related protein expression and radio-sensitivity in oral squamous cell carcinoma caused by betel nut chewing. Oncotarget 2016. (article in press) (Ranking: Oncology 21/252 Impact Factor: 6.359). Wu SY, Debele TA, Kao YC and Tsai HC. Synthesis and Characterization of Dual-Sensitive Fluorescent Nanogels for Enhancing Drug Delivery and Tracking Intracellular Drug Delivery. International journal of molecular sciences. 2017; 18(5) (Ranking: CHEMISTRY, MULTIDISCIPLINARY 54/166 Impact Factor: 3.226). Szu-Yuan Wu, Hsiao-Ying Chou, Chiou-Hwa Yuh, Shewaye Lakew Mekuria, Yu-Chih Kao, Tsai H-C. Radiation-Sensitive Dendrimer-Based Drug Delivery System. Advanced Science 2017. (Ranking: MULTIDISCIPLINARY SCIENCES 3/64 Impact Factor: 9.034). Wu S-Y, Phan N-N, Ho S-H, Lai Y-H, Tsai C-H, Yang C-H, Yu H-G, Wang J-C, Huang P-L, Lin Y-C. Metabolomic Assessment of Arsenite Toxicity and Novel Biomarker Discovery in Early Development of Zebrafish Embryos. Toxicology letters 2018. (Ranking: TOXICOLOGY 14/92 Impact Factor: 3.858). Yen Y-C, Hsu H-L, Chang J-H, Lin W-C, Chang Y-C, Chang C-L, Chow J-M, Yuan KS-P, Wu ATH, Wu S-Y. Efficacy of thoracic radiotherapy in patients with stage IIIB–IV epidermal growth factor receptor-mutant lung adenocarcinomas who received and responded to tyrosine kinase inhibitor treatment. Radiotherapy and oncology : journal of the European Society for Therapeutic Radiology and Oncology 2018. (Ranking: Radiology, Nuclear Medicine & Medical Image,12/125 Impact Factor: 4.258). Shen CC, Cheng JJ, Lay HL, Wu SY, Ni CL, Teng CM, et al. Cytotoxic apigenin derivatives from Chrysopogon aciculatis. Journal of natural products. 2012; 75(2): 198-201. . (SCI, IF: 3.164, Ranking: 27/190). Chou CH, Lai SL, Ho CM, Lin WH, Chen CN, Lee PH, Peng FC, Kuo SH, Wu SY, Lai HS: Lysophosphatidic Acid alters the expression profiles of angiogenic factors, cytokines, and chemokines in mouse liver sinusoidal endothelial cells. PloS one 2015, 10(3):e0122060. (SCI, IF: 3.534, Ranking: 27/190). Chao-Yuan Huang, Wei-Tien Tai, Szu-Yuan Wu, Chih-Ting Shih, Min-Hsuan Chen, Chiung-Wen Kuo, Chung-Wai Shiau, Man-Hsin Hung, Kuen-Feng Chen, Dovitinib acts as a novel radiosensitizer in hepatocellular carcinoma via targeting SHP-1/STAT3 signaling. International Journal of Radiation Oncology*Biology*Physics 2016 (Ranking: Radiology, Nuclear Medicine & Medical Image,12/125 Impact Factor: 4.258). Chen CD, Chen SU, Chou CH, Chen MJ, Wen WF, Wu SY, Yang YS and Yang JH. High Estradiol Concentrations Induce Heat Shock Protein 70 Expression and Suppress Nuclear Factor Kappa B Activation in Human Endometrial Epithelial Cells. Biology of reproduction. 2016. (Ranking: REPRODUCTIVE BIOLOGY,5/29 Impact Factor: 3.47). Lin CF, Lin CM, Lee KY, Wu SY, Feng PH, Chen KY, Chuang HC, Chen CL, Wang YC, Tseng PC and Tsai TT. Escape from IFN-gamma-dependent immunosurveillance in tumorigenesis. Journal of biomedical science. 2017; 24(1):10. (Ranking: MEDICINE, RESEARCH & EXPERIMENTAL, 50/123 Impact Factor: 2.94). Huang TH, Wu SY, Huang YJ, Wei PL, Wu AT and Chao TY. The identification and validation of Trichosstatin A as a potential inhibitor of colon tumorigenesis and colon cancer stem-like cells. American journal of cancer research. 2017; 7(5):1227-1237. 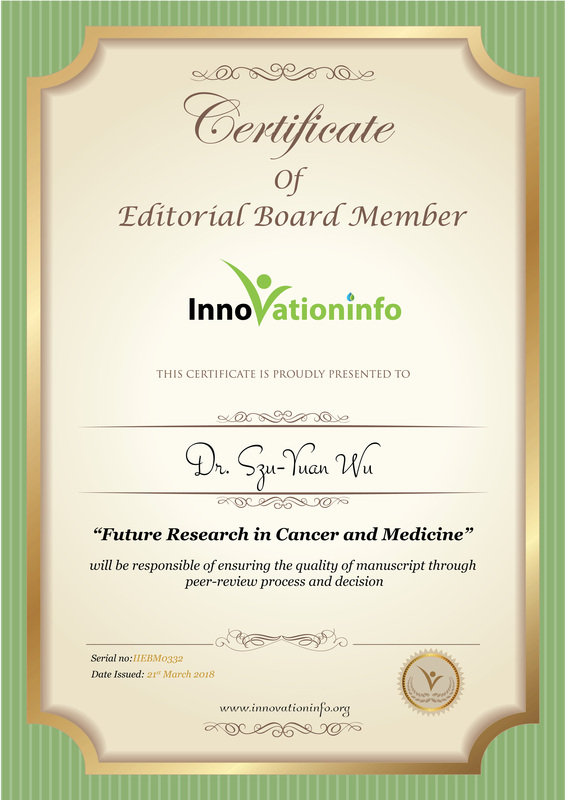 (article in press) (Ranking: Oncology 81/252 Impact Factor: 3.425).